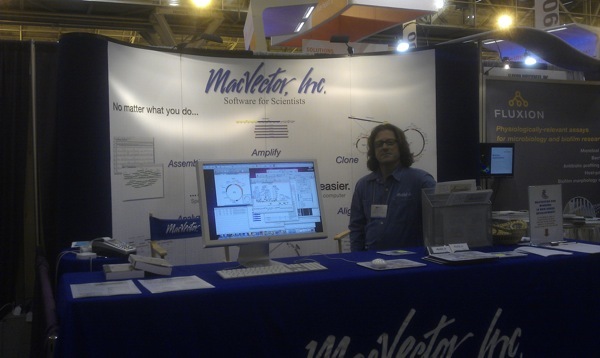 The ASM2011 was a great show. We had a busy booth with some old friends and some new faces. We learnt more about what users need and some of that feedback has already gone into our next release, MacVector 12.5, that will be out towards the end of the Summer. We had fun outside the hall as well. New Orleans is a great city with friendly people, although I never could understand why those guys on the moonwalk knew where I got my shoes. As with the past few years many people were asking whether we run on Windows (we will soon) and can we deal with the gazillion reads of their favourite organism’s genome that they’ve just been given and do not know what to do with (also coming soon). We’ll be adding reference assembly to Assembler 12.5 that will be great for these bacterial genomes.